Yours truly with a bowl full of roasted veggies: Murasaki sweet potatoes, butternut squash, acorn squash, brussel sprouts, almonds, sage, and pepitas. Fifteen years ago today I groggily walked down the hallway toward my mom’s living room after a scrumptious night of Christmas sleep, plopped down on the couch and started watching an interview on the news, (I’m not sure which channel), where two Doctors were discussing vegetarianism. “It takes five days to digest red meat, three days to digest poultry, and two days to digest fish.” That statement was all I needed to hear. I am not sure who said it, but I heard it, and it woke me up. After spending the previous three years struggling with digestive issues, (a reality admittedly brought on by a steady diet of saltines, beer, ice cream, chicken burritos, peanut butter, and scones), I was desperate to find a solution, and suddenly there it was. I have been a vegetarian ever since. Don’t worry, the following stack of words will not be a finger-wagging lecture to implore you all become a vegan or vegetarian, no one likes to be lectured to, but it is the story of why I am one, and a celebration of fifteen years of vibrant life I have lived that I owe to the choice I made on December 26th, 2002 to no longer eat meat. I didn’t give up meat, I chose plants. Lovely lunch: Murasaki sweet potatoes, shaved carrots, baby heirloom tomatoes, and almonds. I was a newly twenty-three year old single lady deep into my career of film and television production, aka, set life, when I started living a plant-based lifestyle. I had just started a new job on the film, “The League of Extraordinary Gentlemen”, an easily forgotten comic book movie with minimal story and tepid performances, but stunning miniature visual effects, (that was what I was working on). On the first day of the hefty two month shoot, I proudly proclaimed to the head of craft services that I was a vegetarian after she asked if I had any food preferences, and another production assistant, my future friend and roommate who hailed from South Bend, Indiana, Molly, scoffed, “Yeah, for like a week.” She was right, I started the job nearly a week into my newfound veggie infused life, but that week was just the first of 780 weeks and counting. An early and long-lasting benefit of eating lots of greens and veggies was that my digestive discomfort virtually disappeared. FUN FACT: Vegetables are loaded with fiber, and fiber helps move food and built up gunk clinging to our digestive walls through our system with speed and gumption. Therefore, food takes hours to digest verses days. That timeline comes in handy when the energy needed to digest food can move through that task quickly and still have enough pep to power a 5’10.5 human on a ten mile run. YAY, Fiber! However, since I was entrenched in the exciting, yet terrifying non-job security career of film and television production, I still subsisted on whatever random non-perishable items I could fit into my backpack after a 13+ hour day on set, a necessary and resourceful method of grocery shopping when the date of your next paycheck is a never-ending mystery. Nevertheless, I worked in massive salads and green juices whenever I accrued valuable overtime dollars and treated myself on those special occasions to nutritious elixirs of health and promise. 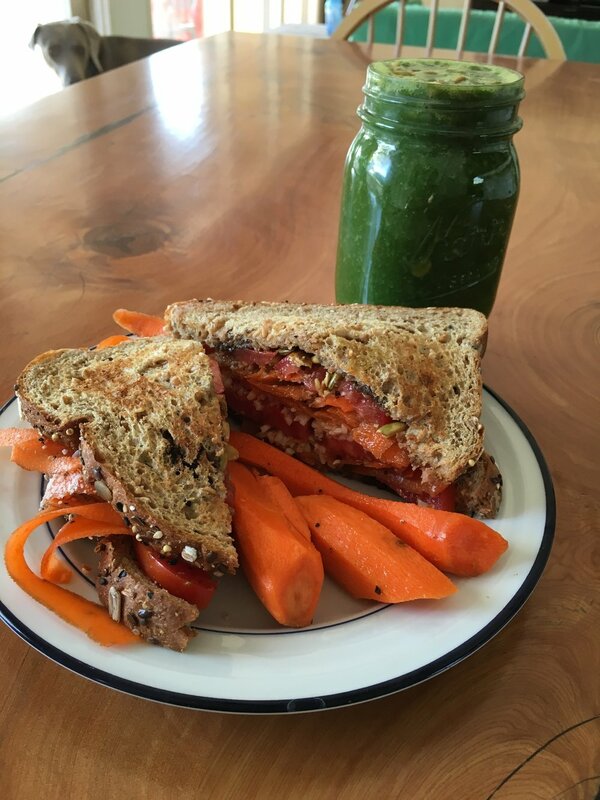 Veggie sandwich and "Everyday" green juice: Shaved carrots, tomatoes, shredded almond cheese, pepitas on Dave's Power Seed bread. In the green juice: Two apples, one banana, water, two handfuls of kale, juice of one lemon, Moon Juice adaptogens, chia seeds, curry powder, and pepitas. In fact, my life suddenly felt simpler because I didn’t have to worry about the cost or dangers of cooking meat, but was rather inspired to create vegetable driven meals that were both satisfying and economical. (Ironically, around this same time the most popular show on TV was The Simple Life starring the attention starved, yet sensational duo of Paris Hilton and Nicole Richie). As I grew up, and explored and survived my 20’s and early 30’s, my reasons to live a plant-based lifestyle expanded as I absorbed information from any avenues worthy to share. I watched numerous documentaries, read countless books, and met and devoured fun and festive conversations with like-minded, yet much more well-informed veggie enthusiasts like myself, and realized that I was not only doing the right thing for my health, but was actually making the world a better place. Meanwhile, there was one more hurdle I had yet to clear, cheese. I love cheese. I love the combo of great cheese and amazing red wine, who doesn’t? Honestly, is there a more acceptable example of sophisticated adulthood than dreamily eating gruyere cheese while sipping on a dry Cabernet discussing taxes, the latest Meryl Streep film, and/or my current favorite Bravo gem, Vanderpump Rules. Anyone? Nevertheless, at the start of 2017, I let go of dairy. On a related note, I stopped drinking, too. “Who are you?” Questions anyone who knew me in the late 90’s/early 2000’s. My post-college graduate self and my sister Sarah livin' it up on her 21st birthday. I am a person who wants to be as healthy as I can be every single day, because tomorrow is not a promise. 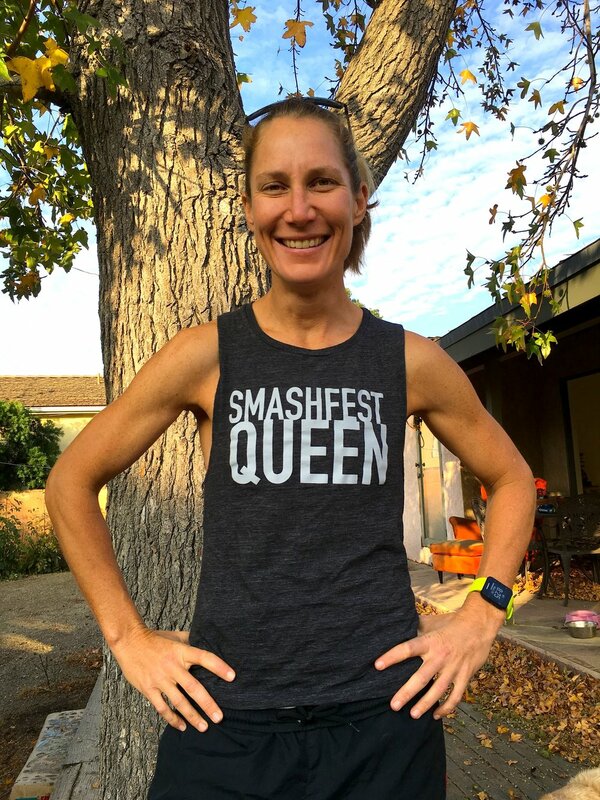 I ask a lot of my body with the intense and consistent training I put her through, thankfully she is usually game on for whatever I toss her way, but over the last year she’s been much more resilient than ever before, and it has showed. I am healthier today at 38 than I was at 28, or even 18, for sure, and I know that my clean living lifestyle is a big reason why I keep growing stronger day after day. There are many proclamations I have made over the years, some I have stuck with, and many I have not; run a marathon, yes, learn to play the guitar, no. Therefore, it is nutty to think at the sweet, supple age of twenty-three, certainly the most uncertain and tumultuous stage of my life, I made a choice that has guided me to where I am today, living every day in good health, good conscience, and steeled confidence to achieve every challenge I set for myself. Forks Over Knives: Available now to stream on Netflix and YouTube. Cowspiracy: Available now to stream on Netflix. What The Health: Available now to stream on Netflix. I really like this new tune from Clean Bandit and Julia Michaels.